Master Bond EP41S-6 is a new two component epoxy system that meets UL 1203, which is defined by Underwriters Laboratories as the “Standard for Explosion-Proof and Dust-Ignition-Proof Electrical Equipment for Use in Hazardous (Classified) Locations”. To meet the UL 1203 requirements, samples of EP41S-6 were exposed to saturated vapors in air for the following chemicals: acetic acid (glacial), acetone, ammonium hydroxide (20% by weight), ASTM reference fuel C, diethyl ether, ethyl acetate, ethylene dichloride, furfural, n-hexane, methyl ethyl ketone, methanol, 2-nitropropane, and toluene. After 168 hours of exposure to these vapors, sample castings in groups of 6 were observed for discoloration, swelling, shrinking, crazing, cracking, leaching, and dissolving. The samples were also subjected to a crush test before and after exposure to these chemicals. The crushing force for EP41S-6 was not less than 85% of the original value. EP41S-6 has successfully met or exceeded the requirements of these tests. EP41S-6 can be used in potentially explosive environments, as defined in National Electrical Code, NFPA 70 (National Fire Protection Association). In fact, EP41S-6 is suitable for use not only in Class I, Division 1 Groups A, B, C and D but also in Class II, Division 1, Groups E, F and G.
Class I, Division 1 Groups A, B, C and D include flammable or hazardous conditions that can exist under normal operation conditions for acetylene, hydrogen, ethylene and propane. Class II, Division 1 includes combustible dusts, with Groups E, F and G covering metal dusts, carbonaceous dusts and non-conductive dusts respectively. EP41S-6 is a thermally stable compound possessing a glass transition temperature of 145-150°C and serviceability from -80°F to +500°F [-62°C to +260°C]. It offers a high dielectric strength of 440 volts/mil at 75°F for a 0.125 inch thickness. The optimal cure schedule for EP41S-6 is overnight at room temperature, followed by 6-8 hours of heat curing at 150-250°F. 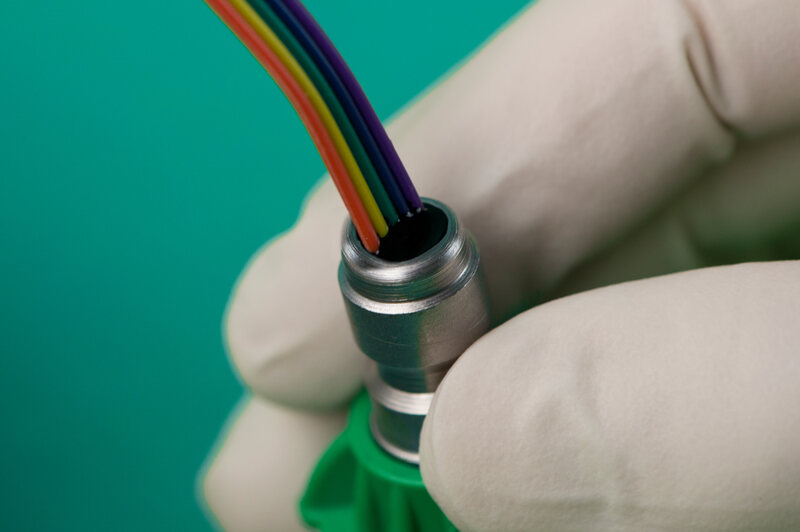 With a mixed viscosity of 30,000-40,000 cps at 75°F, this compound features good flow properties making it ideal for sealing and potting applications for electrical feedthroughs across various industries.